Artist's impression of NASA's Messenger probe at Mercury. The spacecraft has been orbiting Mercury since March 2011 and is scheduled to crash into the planet's surface on April 30, 2015. A new NASA video celebrates the life and accomplishments of the first probe ever to orbit Mercury, just days before the spacecraft ends its landmark mission with a death plunge onto the planet's many-cratered surface. NASA's MESSENGER probe, which has been orbiting Mercury since March 2011, is nearly out of fuel and will smash into the planet on Thursday (April 30), probably around 3:30 p.m. EDT (1930 GMT), space agency officials say. NASA released the new MESSENGER video on Monday (April 27) as a tribute, and a memorial of sorts. 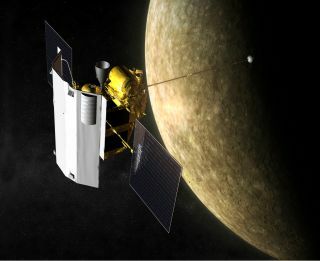 The $450 million MESSENGER mission, whose name is short for MErcury Surface, Space ENvironment, GEochemistry and Ranging, launched in August 2004 and took a circuitous route to the solar system's innermost planet. MESSENGER was originally tasked with a one-year mission at Mercury, but NASA granted two extensions to allow the probe to investigate new questions raised by its initial observations. The spacecraft has delivered with a treasure trove of scientific finds, agency officials said. "The mission discovered a surface rich in diverse chemistry, including volatiles. It sensed a bizarrely offset magnetic field," NASA officials wrote in a statement accompanying the new MESSENGER video. "It photographed strange "hollows" where material seems to have boiled away into space under the scorching sun. It mapped vast volcanic deposits, found that the entire planet has shrunk by as much as 7 kilometers [4.3 miles] in radius, and, of all things, uncovered deposits of water ice in the depths of polar craters where the sun never shines." MESSENGER will crash into Mercury while going about 8,750 mph (14,080 km/h). The 10-foot-wide (3 meters) probe will hit at about 54 degrees north latitude, mission team members have said, and will likely gouge out a crater about 52 feet (16 m) across. The impact won't be visible from Earth, and neither will the resulting crater. But the European/Japanese BepiColombo spacecraft, which is scheduled to launch in 2017 and arrive at Mercury in 2024, may well be able to spot and study MESSENGER's grave. Such work could reveal insights about the rate of space weathering at Mercury, mission officials have said.